In the end of 2017 I applied to a TMET education in Greece. TMET stands for Training Medical Education Trainers and aims to train students to operate and affect students, universities and other agencies in the study, promotion purposes. I never thought I would get the opportunity to go, but I was looking for fun. Two weeks before the event was to be held, I had given up hope of getting a place of education but then I got an email that I was accepted. I spent very happy and booked the flight directly! When I arrived in Thessaloniki, I knew virtually nothing about the city except that it was the second largest city in Greece. As soon as they came down from the plane was felt warmth, the smell and feel of the Mediterranean. The city has an incredible harbor and the long fine beaches. A combination of ocean, good food and Greek culture can never be wrong. Really fun, it was also that many in Greece could say a few words in Swedish and Arabic! Since the announcement of the admission came at such short notice, I could not prepare myself too much for TMET training. The training started on a basic level, and it was not difficult to keep up with the funny discussions. Gradually became the discussions and the workshop more nuanced and it was not always clear that all felt the same about the things we take for granted in Sweden, for example, student loans. We discussed from the hierarchy of the university, studenträttigheter, curriculum and written examinations. I had previously understood that Sweden had it much better than other countries in terms of people's right to education, but to see such large differences within Europe was shocked. Participants described that in Europe there is a large percentage of people who can not study because of poverty, Teachers who take bribes and serious restrictions on students' rights. The training lasted four days and was very intense, you could have session 10-12h per day, which was sometimes tough. However, as was the atmosphere among participants and leader very well, which made it still could stay focused and committed throughout the program. The accommodation was surprisingly good for being a hostel, a big plus was that the hostel had great rooms that we could have training on. Another factor that made life better was that it lasted three IFMSA-training at the same hostel which meant that we were a great group of members who had fun together. 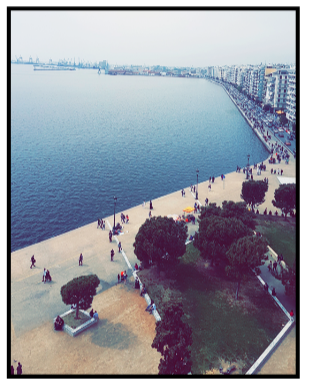 Despite the intense schedule we had time to discover the wonderful city of Thessaloniki. Walking distance from the hostel, port of Thessaloniki! It has been great fun in Greece and I am very grateful for all the new friends I've met. The experience I have wrought in TMET I will never forget. It was really an awakening when they realized how difficult the situation was also in Europe. I am also very pleased that we not only discussed problems in medical education but also potential solutions to existing problems. This has meant that I am motivated than ever to influence the man can influence the. Nobody can do everything but everyone can do something! last ArticleWelcome to speak up about the association! Educate yourself to an international trainer in Wales!